HOW UNDERDOG #SFGIANTS KEEP COMING BACK IN POST-SEASONS 2010, 2012, 2014 -2016? #PEDs | Where Did You Go Joe Dimaggio? They may have waited until the last week of September and first of October, but the San Francisco Giants appear to be back at it, once again sneaking into the playoff picture as the last Wild Card in the National League. After the most dreadful half season in Giants history – or in baseball history of the last fifty years – the Giants are suddenly winning again, gaining their only their second series sweep since the July All Star break, this against the division-leading Los Angeles Dodgers, to close out the regular season. They’ve won 12 of their last 13 games in the playoffs, this from a 2014 team with one legitimate playoff starting pitcher and two, maybe three hitters and numerous untested rookies and castoffs. Again , this for the third in five years, the San Francisco Giants have snuck into the playoffs as the 10th of 10 teams. And 2016 will be no different as indicated by a last minute surge by the Giants. Not surprisingly. For the third out of four even years in a row the Giants have defied the odds again by backing into the playoffs after playing the worst baseball in the national league the entire second half of the season and a historic streak of futility. How do the anemic Giants manage to suddenly come from the depths of despair to beat two of the better teams the last week of the season? But How Do They Do it Repeatedly, Year after Year in Playoffs? One asks ‘How does a good hitting team like Washington or Pittsburg suddenly stop hitting against the Giants while the Giants start hitting? Well, we know the Giants have been pitching above their heads as they’ve done all three years they’ve made the playoffs since 2010. We mean, a 1.00 ERA over 12 consecutive playoff games coming into Game 2 against St. Louis.Come on. But the hitting is another thing. Half the Giants starting lineup has been a Triple A team much of the time but yet they’re ALSO doing things from the hitting side that are unheard of. Like only striking out Four times a game, repeatedly. That’s how many strikeouts the Giants have made per game coming into Game Two against the Cardinals. Come the playoffs and against top pitching THEY STOP STRIKING OUT. More so than any other team in the playoffs. Go figure. WHY? Lots of people call the Giants lucky. Why? Of course with only two bona fide hitters in the lineup, maybe three, they’re not putting up big numbers but , at the same time they’re putting the ball in play, more than the other teams. Even guys like Blanco and Perez (or later replacements) who would be normally striking out on other teams are putting the ball in play for the Giants. Of course, a guy like Panik , who was only put in the starting lineup in August in desperation after even Uggla couldn’t get a hit, has suddenly become one of the unlikely stars the Giants always come up with in the playoffs and season’s ends. Most people are casual fans and don’t take the time to ‘investigate’ or don’t care if the Giants are doing something untoward. After all, everybody’s doing it now, even the government. Yet, some may be doing IT a lot more than others and, when it affects others adversely, like opposing teams, the perpetrator must be called out. And few , if any , seem to want to take the time and effort to make the important statement; that’s where this blog comes in. After three Giants World Series and 10 years of Bondsian shenanigans , it’s high time to call out the Giants. Sadly, other than 2007 ‘Game of Shadows,’ the local media in liberal San Francisco are either drinking the koolaid themselves or don’t care . 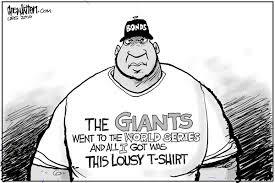 And, the fans, well, most have grown up on Barry Bonds and only know Giants baseball Barry Bonds-style. WHY? Lots of people are calling the Giants lucky. Why? Look at patterns from year to year and there’s got to be a lot more to it than luck. The Giants will go into hitting streaks, especially when it comes to the late season and playoffs. Every time. Doesn’t matter the names. Pagan’s gone. Morse was gone. Lincecum, one of their key starters they paid $20 million a year is effectively gone. Doesn’t matter. Just keep running out players like they did at second base until one takes the kool aid – or, Lightning in a Bottle, as some call it. TRAVIS ISHIKAWA is another guy who couldn’t make it with another team, batting near the Mendoza line. Come to San Francisco and, suddenly, he’s a .270 hitter- even in the playoffs against top pitching. JAKE PEAVY was 1-13 at Boston with a 4.70 ERA through July of this year. Comes to the Giants late season and, after one or two rough outings he’s a five game winner with a 2.20 ERA. Says being back with Bochy and a few mechanics is the answer. Pretty good Peavs to be able to drop your ERA two and a half points just by changing teams. 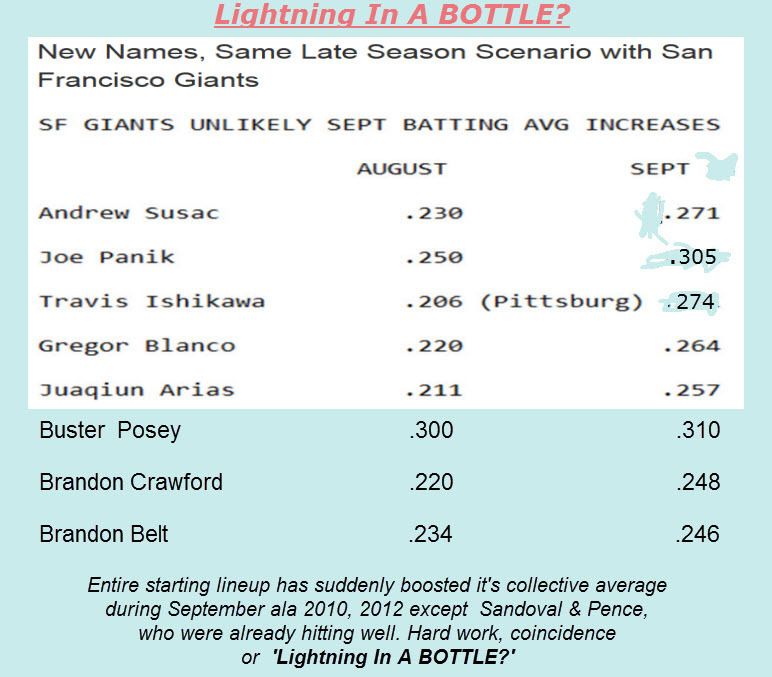 Well, I guess Scutaro did it too in 2012, going from .260 at Colorado to .350 with the Giants second half. Come to think of it, just about everyone on the team improves their numbers on the Giants in late season! Did we mention the Melk man, Mota , Guillen and Torres. The Giants don’t want us to talk about them even though they were a key part of the 2010 and 2012 World Series teams. Without them, there probably wouldn’t have been any world series victories in SF. BOTTLE being the key word. There’s what we believe could be the answer to the question people are asking. Too much of a coincidence otherwise. The Giants had the weakest team going in the playoffs all three years since 2010 and they marched over teams. The only reason they lost last night against the Cardinals is because everyone’s favorite manager, Bochy, put in that rookie pitcher, again, to give up a fourth home run in four appearances. Even Lightning in a Bottle couldn’t help him I guess. The bottle’s running a little dry for Machi, too, but everyone else seems to be thriving on whatever’s in the bottle. 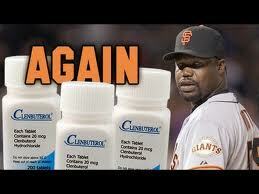 Read that article about Adderall the new PED (LEGAL) of choice for major leaguers? 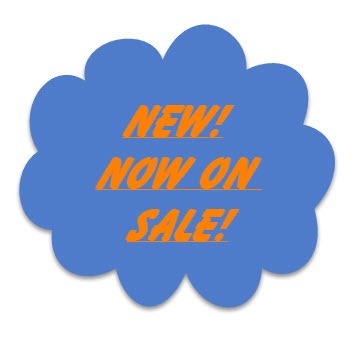 We may be seeing affects of Adderall in the playoffs – SEE ALSO BELOW ‘BREAKING NEWS.’ Check it out. 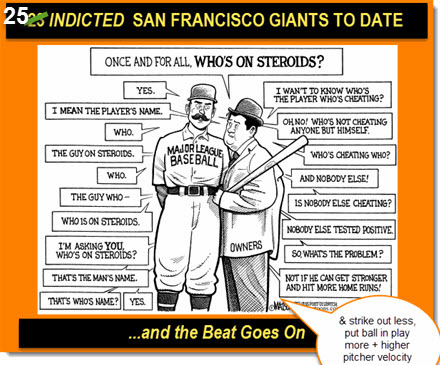 With the Giants history of 23 indicted players since Bonds and Andres Torres ressurection in 2010 thanks to Adderall, we wouldn’t put it past the Giants to be taking advantage of this LEGAL helper… If 10% of baseball players are using this legal loophole, it could be 20% or more for the Giants. That’s the only answer we can give you – and perhaps Victor Conte’s old tried and true, undetectable designer testosterone. Maybe a little HGH thrown in,too. San Francisco Giants. Win at all costs. 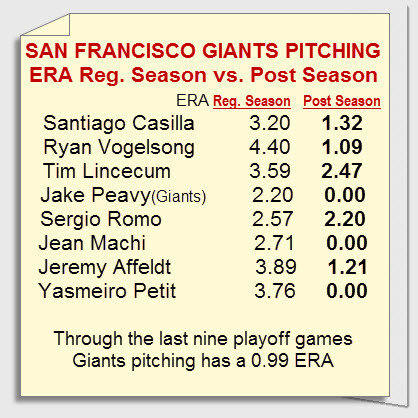 How did Peavy and Vogelsong, other 2014 Giants pitchers raise velocity, lower ERA -0.99 10 games? GIANTS ONLY STRUCK OUT 4 TIMES PER GAME ! 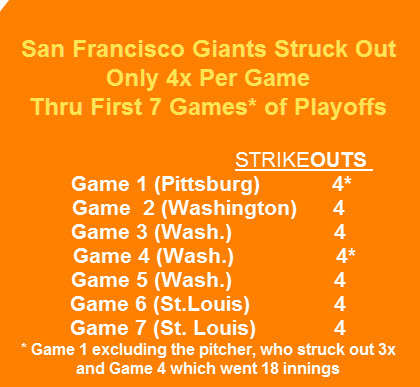 Up to the second playoff game against St. Louis, the San Francisco Giants had only struck out four times in every playoff game (except for the pitcher in the game against Pittsburg and long 18 inning game against Washington). When a team stops striking out they’re putting the ball in play and good things are going to happen, i.e. more Giant hits and forced errors -and that’s exactly what happens when the Giants get in the playoffs or in late-season important games. As for the hitting, the unlikely Giants pitchers always ramp it up in the playoffs, ie lowest ever 0.99 ERA through 12 payoff games in a row. The other team doesn’t have a chance. It’s almost like we’ll be SURPRISED IF THE GIANTS LOSE ANY PLAYOFF SERIES! You had pitcher Vogelsong pitching the other night with the same velocity as ace Bumgarner, which is pretty hard to imagine – the 36 year old 5th man matching the ace of the staff! No wonder he shut down the Nats – as did all the Giants pitchers, really. And Peavy was ramping it up there in the low 90s, too – something he hadn’t done for some time until he came to Giants. Just change the names -they’re all pitching like world beaters in the 1.00 ERA range. every year they get into the playoffs when they suddenly stop striking out and putting the ball in play more and thereby getting on base while forcing the other team to throw more pitches and make more errors; and this is with a normally weak hitting team that does strike out a lot in the regular season. No wonder the other teams go crazy and can’t get these ‘no-name Giants’ out. Combine that with old war horse pitchers like Vogelsong and Peavy suddenly throwing 93 mph (which he hadn’t done for weeks or years) the other team doesn’t have much of a chance, whoever they are. 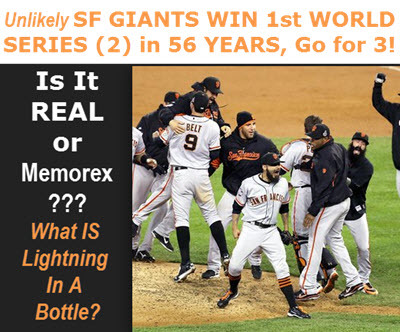 Of all the teams in the playoffs the Giants, sans lighting in a BOTTLE, are the most unlikely to win 12 games in a row in the playoffs -but they did it and with pitchers’ microscopic 1.00 ER while setting records. People – especially Giant ‘psycho’ fans are calling it talent but the Giants are no more talented than any team in the playoffs, probably less, just as in 2010 and 2012; in fact, they were the 10th and last team to make it this year (2014) as in 2010 and 2012. There’s no way they should be consistently beating better teams like Washington, Detroit and St. Louis with their weak line up including rookies with barely two months of major league experience. As for the manager who some call a genius, Bruce Bochy is barely an above-.500 manager – except in the playoffs – in his years both at San Francisco and San Diego; take away the World Series years and he’s a below .500 manager both in San Francisco and San Diego. This from a team that came into the 2014 playoffs with one bona fide playoff caliber starter in Bumgarner and he loses the only game the Giants lose in 11 games while the other pitchers are giving up less than 1 run a game to normally top hitting teams , incredibly ,and this goes back 10 games in the playoffs – with unproven or over the hill pitchers with very average track records and higher ERA’s become superstars in the playoffs. It ain’t likely. In fact it’s almost impossible without the help of outside agents, it would appear; for one or two games it could happen as a fluke -yes it can happen as a fluke but for 10 games in a row – and then for three years in the playoffs since 2010, no. Quite bluntly the Giants are drinking the Kool-Aid it would appear; they’re running out pitchers they know have taken the koolaid; only on the Giants could you have a team come back with markedly different players three alternate years and get into the World Series ; no matter missing a Matt Cain , a Pagan, a Morse-The Giants find other Kool-Aid drinkers to fill in. The Giants don’t need to make blockbuster trades – after all they didn’t even make the midseason move for a big hitter they really needed , yet here they are again in the playoffs, performing as you don’t see during the regular season . It mostly happens in the playoffs and then World Series for a third year in five! It used to be more about hitting in 2010 and 2012 when players like Scutaro, Ross, Huff and Burrell and their ‘sudden surges’upon joining the Giants and , especially, appearing in the post season . Now that the league pitchers have ‘caught up’ and surpassed the hitters, as it were.Thus, we focus on pitching. While there are still Giants hitters, like Sandoval , who regularly improve in the post season, it’s more about pitching this year. We see in the chart , above, how virtually every pitcher on the team improves dramatically in the postseason, and we might say last month of the season too, year after year. The Giants have gotten good at this since Bonds and perfecting their unlikely ‘technique’ knowing when and where to take the koolaid -they call it lightning in a bottle – as they do and get away with it now 20 years 25 years since Barry bonds popularized it with 23 indicted giants along the way and nobody’s tried to stop or even question them other than the all but forgotten book ‘game of shadows’ 7 years ago in this liberal media market where anything goes and nobody seems to care. We can add that these players, in general, also improve when they first come to the giants and continue on. Oh and don’t forget BUMGARNER -not even listed in above chart – owner of Monday’s shutout performance , who has dropped his ERA also into the zeroes! We see from the above chart a typical late-season improvement by Giants hitters. While the Giants haven’t quite been up to their usual October standards , other than Sandoval and a couple others – perhaps due to improved opponent pitching – don’t be surprised to see it come back , ala 2010 and 2012. As it is one can get an idea, how again the Giants have suddenly improved their hitting late season, when most teams tire and fall off. Pretty startling, isn’t it? The above chart shows that it’s not just the playoffs. 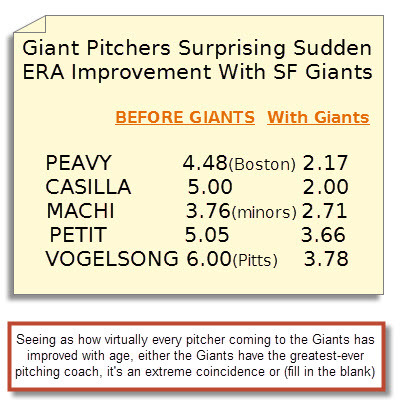 Giant pitchers improve just coming to the Giants, almost like magic! Yes. The San Francisco Giants may have learned well from the local PED guru, Victor Conti of Balco fame, and perhaps others now 25 years later . As Conti will tell you, anybody should be able to’ get away’ with what the Giants appear to have been getting away with if they do it correctly; the only times people get caught , to quote Conti, is if they’re “dumb or dumber” as in the case with Melky Cabrera, again, quoting Conti. Like, how else to explain the San Francisco Giants 0.99 ERA in 12 consecutive games in the playoffs? We can understand if it was one or two games we call it a fluke but 12 games in a row where the ERA has been .99 average just doesn’t make sense . Maybe with four Sandy Koufaxs’ but not with one ligit starter and four older pitchers who could barely remain the big leagues. 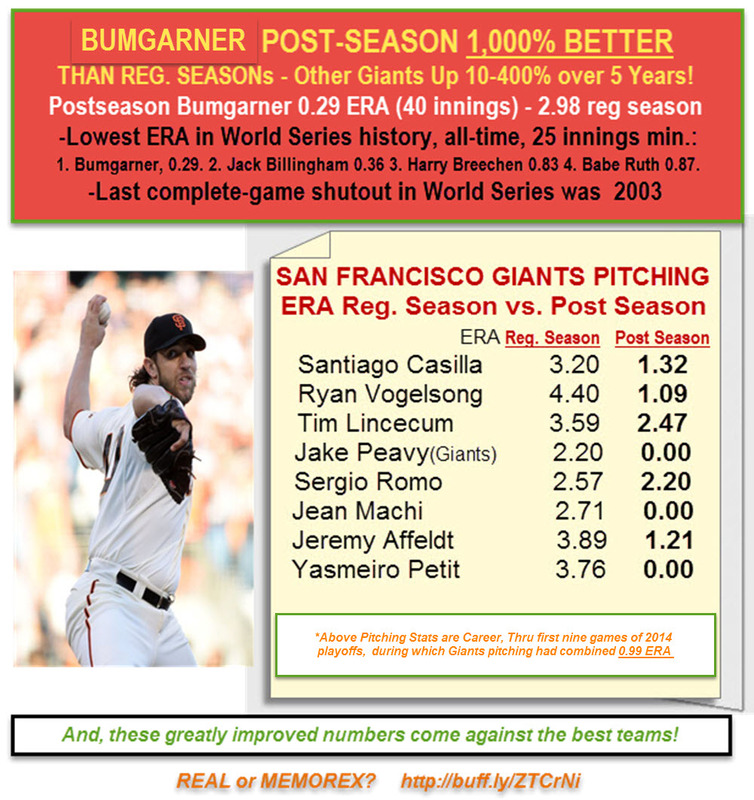 -YUSMEIRO PETIT was a no-name pitcher before ycoming to the GIants with a long, mediocre history. A career 5.05 ERA, he has brought down into the low threes with the Giants including a near no-hitter and 46 street innings of no run ball is their third starter. In big games for the Giants he almost always comes through. -TIM HUDSON is a 39-year-old pitcher who somehow struck eight players in seven innings against Washington – more than the Washington ace, Zimmerman’s six strikeouts; Hudson matched other Giant starters, holding them to one run in savings just as Peavy did the night before and Bumgarner and Vogelsong have been doing. -RYAN VOGELSONG was another over the hill journeyman picther with a 4.0+ ERA before he came to the Giants. Once in S.F. , things quickly turned around for him; he mysteriously was able to up his velocity while cutting his ERA from 6.00 to 3.78 – even lower this year. – And on the hitting side don’t forget JOE PANIK. The Giants had some much confidence in him they brought in Dan Uggla from Atlanda and his .169 batting average. At least he had a decade of major league experience. Panik has had two months and yet he’s suddenly, somehow hitting as well or better than his minor league average. – Ditto for SUSAC and DUFFY. The Giants magical bottle allows them to have better hand-eye co-ordination, see the ball better while striking out less than any other team in the playoffs, putting the ball in play and getting more hits and on base with inferior ( on paper)players like Blanco, Perez, Susac, Duffy….. Hopefully the best team will really win this time and put a stop to the one-sided giant shenanigans of 2010 and 2012. How Giants hang in there and force errors on other teams. …St. Louis is lucky they got away with it in Game 2. We should say ‘lucky’ but Giants are really the lucky ones because they’re using means that shouldn’t be used. No way guys like Blanco and Perez should not be getting those base hits against 97 mile-per-hour throwing pitchers . But the Giants have a little extra curricular thing going and they don’t strike out during the playoffs and they put the ball in play and eventually good things can happen for them. They almost pulled it off in Game 2-their first loss in 12 playoff games (! )- but the Cardinals being the better team deserved to win. Glad to see a team finally stand up to the Giants, whatever it takes. If drugs are going to be part of a game, let the other team match up. Give credit to the Los Angeles Angels, and especially formerly PED- indicted player Josh Hamilton preemption playing a clean against Kansas City Hamilton was out quite a bit and not able to work on his hitting in contrast to the giants Brandon belt who was not able to practice following being out , yet came back and started right off hitting home runs including the game-winning hit against Washington in the second game 18th inning homerun. We’d also like to know if drug testing is being done during the playoffs or just during the regular season. We know that testing is done during the off-season now. It needs to be done during the playoffs. definitely. San Francisco Giants GM Brian’s Sabean attributes the Giant continued success in the playoffs to their experience in the playoffs but the fact of the matter is that over half the 2014 team is different from two years ago (2012) and almost every player different from four years (2010) ago when they first went all the way to the World Series victory. Of course, in 2010 they had NO experience and won with a similar, unlikely team of modest talent. But then maybe there is something to experience, experience in finding out certain ways to win , devious or otherwise – getting it down to a science how to do this. In the Giants case, it’s bringing in marginal players who might ‘take the kool aid’; why waste money on big name players when you can just keep running guys out there until one sticks? We’ve seen it time and again. Scutaro had limited playoff experience when he came over and suddenly started hitting in 2012, nor did Peavy have much playoff experience when he came IN 2014, nor Cody Ross or Huff or Burrell when they came for short stints in 2012 to suddenly start hitting and propel the Giants. Really , experience had nothing to do with THAT. The only experience is Sabean knowing how to ‘play the game’ he probably learned from Bonds; and after nobody said anything other than a couple reporters once he found out the Giants could keep getting away with it – ever since the Bonds days and 23 indicted players later . We’re not saying all the Giants are using artificial means but when you look at the numbers – and now with legal Adderall we know that 10% of major leaguers are taking it – you have to wonder…seeing all the Giants continued other-worldly stats piling up in the playoffs and World Series – without benefit of a lot of TALENT (including Pagan and Cain this year). Then you have many of the same players and others who’ve come to the Giants and improved instantly , including many older players who are doing better at advanced ages than they did during their primes – and now you have new young players who came out of the blue to perform well late season and in the playoffs – as the attached statistics show (and these are only for 2014, not showing all the others like Scutaro, Ross, Huff and co. who had ‘sudden surges’wioth the Giants….. Finally, as we went into the 2014 World Series it’s interesting to note that PEDs may have already been affecting baseball’s world series 25 years ago today when the Giants played the A’s in the ‘Earthquake Series, ‘ as we later learned that Mark McGwire and Jose Conseco of the A’s were hitting at a record clip with the help of Creatine and other PEDs at the time. Who would have thought that 25 years later the Giants are likely, as we see it, still using PEDs perhaps even moreso than what we saw back then. There is some question as to the still ‘undetectability’ of designer testosterone, long the favorite of players over the past decade. “It’s very, very easy. It’s like taking candy from a baby. They only test the players when they’re at the ballpark,” Conte explained. “Therefore, after a game, you can apply a testosterone cream or a gel or a patch, and this will peak at about four hours after you take it and be all the way back down to baseline about eight hours after. … This helps with tissue repair and healing and recovery, so they just wait until after the game and apply it … and they get the benefit of having that testosterone circulate and accelerate healing. 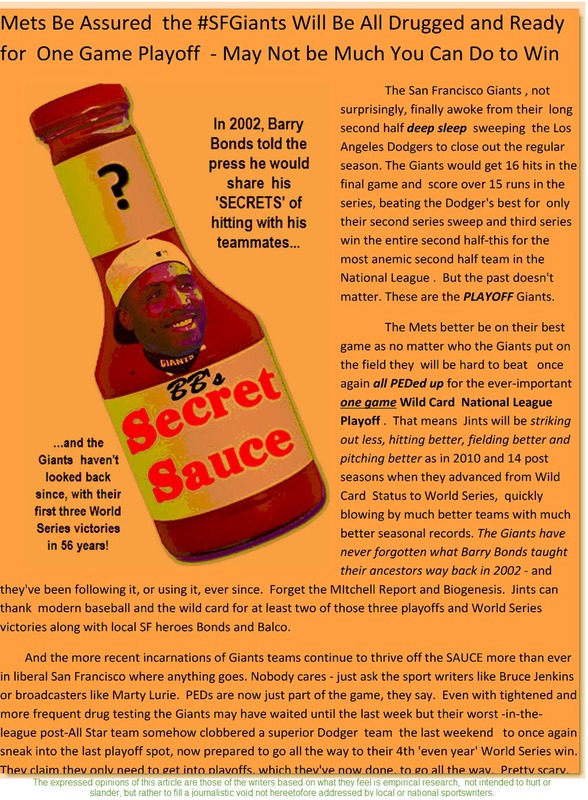 Twenty years since Barry Bonds joined the Giants, in 1997 – and 27 indicted Giants later- San Francisco continues pulling the wool over the eyes with that ‘secret’ Barry Bonds even announced, publicly, he would be sharing with players. 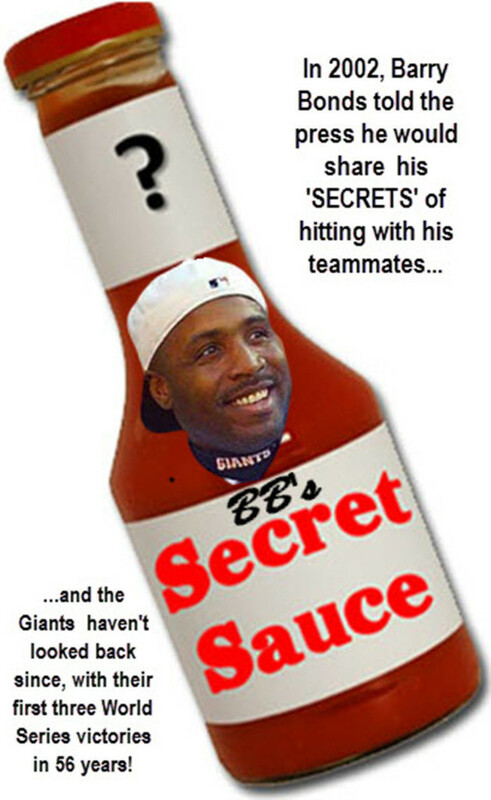 Barry Bonds may be gone but the Giants have done well with that secret Bonds shared. And they haven’t looked back. In a league with drug use as common as Conte claims then perhaps it’s not so awkward for Cabrera to win the batting title. We also have learned in the literature that these new PEDs, even though hardly detectable in testing- if at all (Adderall) – will stay in a player’s system for some length of time.So, even if players take PEDs during the off-season they could have a real affect on the game the following season even if the player is no longer ingesting the drugs. That’s the one scenario, but, more than likely, players are using DURING the season and getting added spikes of performance, as needed, ie playoffs and World Series.